The shopping, now, is different from what it was a couple years ago, and from what it will be a couple years later. New, advanced technology, the fierce competition and customer’s sanitation - all these factors are constantly changing both physical and online trade. And, much like animals that evolve adjusting to the natural environment, shop owners need to adapt to the current e-Commerce conditions, in order to stay relevant and successful. 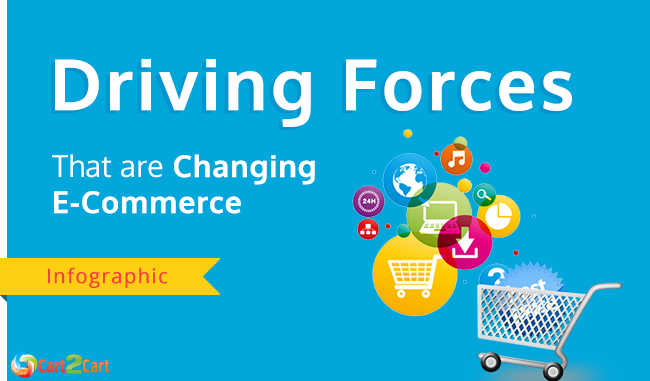 The following infographic from GetElastic describes how is e-Commerce changing right now, and the top 3 driving forces causing its transformation. We hope you’ve found the uplisted stats useful, just as we did. However, theoretical knowledge is worth nothing unless you apply practically. So, consider this post a sign to take action. Cart2Cart wishes you a good luck with your online business.